Sal is one of the most popular of the ten Cape Verdean islands, located just off the North West coast of Africa. If you’re looking for a slice of authentic African landscape and culture, you will still very much find it here but with undeniable European influence prevalent amongst its architecture, language and religion. The mix of the two makes for a beautiful place to visit. You will be amazed by the amount of different languages you hear in Sal, yet English seems to be amongst the few. Portuguese and Creole are the native languages, where I admit I felt pretty in my element having grown up in Portugal! Along with its beautiful stretches of sandy beaches and turquoise blue water, the barren African landscape, the sand pans, the incredibly delicious food, the warm weather year round and the vibrant and buzzing streets of Santa Maria, Sal should definitely be on your bucket list of places to visit. I flew out for a week in mid January with my friend for a week of relaxation. The flight is just short of six hours, which actually seemed to go by extremely quickly. As I landed and left the airport, I was instantly surprised by the raw and undeveloped state of the island. Still so untouched by tourists, with long stretches of barren desert land and salt flats for miles. A country that has not yet properly been discovered nor built on or developed by the tourism industry. An island with heaps of potential and beauty, unfortunately crying out for development and tourism. I guarentee it will be a very different place in five to ten years with development plans for new hotels and casinos already under way. Sal is famous for its wind. It is one of the worlds top destinations for wind and kite surfers and you will often see hundreds on the beaches and worldwide competitions taking place here. The wind was quite strong when I was there but in the summer months it gets less so and makes sunbathing that bit more pleasurable, not that it wasn’t, but a wind shelter is definitely recommended. The average temperature when I was there was around 25 degrees but in the summer months it warms up to the late 20s/30s. With the local mantra being ‘No Stress’, there is a nice sense of calm and uninhibitedness on the island which I absolutely loved. It was so easy to feel at peace and relaxed. Chilling on the beach was my favourite pastime throughout the week ( no surprise there, I’m sure). Although, if you know me, I do also love a good party and good music and one place that is quite different due to its more luxurious and modern vibe is ‘Bikini Beach’. A beautiful beach club stretching fourty metres in to the ocean which boasts amazing views from its modern white terraces. Bikini beach is perfect for day parties watching the sunset over the Atlantic ocean whilst listening to local and international DJs spin their tunes. Another reason I am keen to return is due to the amount activities and things there are to do on the island, which due to my persistence in ‘just chilling’ we didn’t get round to do! However, I hope by some of the images and video, you get a feel for the beauty and rawness of the island. You can go shark watching, quad biking, kite surfing, island boat tours, floating in a salt mine and many more, so if I were you I would plan a trip to the secret spot of Sal, Cape Verde, whilst it still remains as untouched, authentic and as beautiful as it is. I’ve always loved skiing from a young age. There’s just nothing quite like the adrenaline you get from bombing it down the most breathtaking mountain range, blue skies in sight and inhaling the freshest of air on your decline…Bliss. Now for the avid skiers, I’m sure you will be well aware of La Folie Douce and its infamous apres-ski parties on the slopes, so when we heard they were opening the first ever Folie Douce Hotel, I jumped at the chance to go out and experience it. Located in a prime spot in the centre of Chamonix Mont Blanc, the hotel has ski-in , ski-out access to the Brevet Ski Resort, so it’s perfect for mixing apres and skiing. Our trip was organised by Ski Solutions, one of the UK’s leading luxury ski tour operators. From organising our stay, to our restaurants and ski passes, they really did an amazing job. I invited my two friends to join me on my trip, as Jordan was busy doing her 10 day silent retreat in Thailand. As we approached the hotel, nestled between the snowy mountains, smoke transpiring out the top, it oozed a sense of grandeur reminiscent of that of The Grand Budapest Hotel. Walking in, the interior was equally as stunning, each room with its own distinct personality and the carpets full of character and intricacy. The one closest to the entrance was a beautiful beige, detailed map of the world. The rooms, of which there are 250 in the whole hotel, each have a stunning view of the mountain ranges outside and are so cosy. We had a deluxe room, perfect for the 3 of us and one of the evenings, instead of getting involved in the Apres ski, our room was just too tempting, so we all just snuggled up and watched a film, watching the snow fall on to the mountains outside. Cosier than that? Impossible. Now, if you’re not a big skier, nor a big drinker (party-goer) then do not fret! These guys also have wellness, fitness and relaxation down to a T. The feel good club sports and spa hosts an 18-metre heated outdoor swimming pool, saunas and a steam room, relaxation room and a sun terrace overlooking the majestic mountains of Chamonix. They also have eight massage cabins and offer a whole range of different treatments and massages. Unfortunately we didn’t get to experience this, we were too busy skiing….and partying but a massage would have gone down an absolute treat. One of my favourite parts of the hotel was the food. (No surprise there) The hotel has three different restaurants. Le Petit Cuisine, Le Mayen, La Fruitiere . The first night we had dinner at La Petit Cuisine, which is also where we had breakfast each morning. It’s a gourmet self-service restaurant relying on quality, local produce, plus a great atmosphere. In the mornings there’s just the most amazing spread of freshly made croissants, pastries, pancakes, waffles, fresh fruits, condiments, jams, cheese, hams, eggs, savoury delights… You name it, they have it. The best way to fuel up before a long day on the slopes! On our second evening, we really went all out with traditional comfort Alpine food. Yes, we’re talking cheese fondue, raclette, potatoes, hams, breads, pickles and all the sides. Le Mayen, is the restaurant to hit the spot, perfect for a post-ski workout. Mouth-wateringly delicious and guaranteed to have you rolling out of there feeling satisfyingly cheesed-out. So the infamous Apres- ski takes place between 4pm and 10pm. The main area is in the lower part of the hotel, where you will be greeted by singers, big-screen projections, breath taking light shows, dancers, DJs blaring out the tunes and quite possibly an array of keen skiers dancing on the tables, necking the booze and getting down to the dirty Dj beats. It sure is an amazing experience. Our last night had to be one of the best. We went down to Apres around 8pm after our cheese-induced comas and ended up getting very involved in the dancing, the partying, the booze and ended our night in a traditional bar in town full of avid ski-goers ready to party their socks off. A night to remember no doubt! The skiing itself was equally as fun. The ski lift is right outside the hotel making it super easy to access the slopes. The mountain range, The Alps, are breathtaking and the first day was probably one of the most beautiful conditions I have ever skiied in. Bright blue skies, above the clouds and the beaming sunshine on our faces. I am so impressed that the hotel had opened a matter of days before we arrived, as everything went so smoothly. Ski solutions really did pull out all the stops to make sure our stay and ski experience was a fantastic and memorable one. If you’re looking to go Skiing, Chamonix is the perfect place to go and no better place to experience the whole shebang that at the Folie Douce! If you’re looking for a lovely, laid-back retreat abroad, look no further than the ‘Retreat to Crete’, a yoga and cookery retreat that nourishes the mind, body and belly! Set amongst a rustic and beautiful backdrop of the majestic Cretan sea in a gorgeous, Greek-inspired villa, the retreat offers a lovely space to have some much needed down time whilst also mingling with some fabulous like-minded people. What I loved about this retreat was the informality and relaxed nature of it. With the retreat in its infancy, hosts Betty and Caroline were so welcoming and open to anything we felt like doing (or not doing) it was a real home from home. With another 8 attendees on the retreat it felt like one big happy family where we all cooked together, feasted together, explored the local town, hiked through stunning landscapes, visited a beautiful monastery and all whilst appreciating the breath-taking surroundings. We spent 4 days at Villa Delfini and every morning we would partake in either sunrise yoga or a lengthy swim in the pool followed by a lovely breakfast spread of Greek yoghurt, local honey, walnuts and fresh figs topped off with some stimulating local Greek coffee. Arguably the perfect way to start the day! Over the 4 days we learnt to cook some mouth-watering Greek inspired dishes, courtesy of the extremely talented chef, Betty, who taught us how to make Gigantes Plaki (slow cooked butterbeans), BBQ’d Octopus in garlic and lemon, stuffed courgette flowers, Cretan dakkos and of course our fave, Tzatziki. Skills I am still yet to put into practise in the kitchen but definitely top of my recipe list once summer pokes its head around again. The day ended as well as it started with a lovely cooked meal (prepared by us) with some delicious local wine. Exercise wise the break was quite relaxed. Whilst starting the day with either a swim in the pool or a yoga session with the inspirational Caroline, we also hiked and swam at the local beach which was a beautiful cove, rustic & quaint in nature and devoid of tourists. Added extras on the retreat were wine tasting and massages from the local masseuse, which was a great way to unwind and recuperate. This really was the ideal retreat. If you are a foodie like us, love to unwind, meet new people in an intimate setting whilst also appreciating beautifully scenic views and sunsets, this is the place for you! Can we come back already Betty & Caroline?! The hidden cove you need to discover! A couple of weeks ago Loanne and I whisked my Mum away for her belated birthday present. The criteria were as follows; Sun, seclusion, a private pool with stunning views, not too far on a plane and somewhere blissfully relaxing. So not too specific… Ha! Our options were whittled down to one place that fit the bill perfectly! Nestled in a private and secluded bay on the northeastern island of Crete, (the largest of the greek islands) Daios Cove is nothing short of spectacular. Below I have outlined why this is the ideal place for anyone looking for a serene, secluded and beautiful getaway. Oh and my mum LOVED it, as did we! With a 50 minute drive from the airport, there’s no need to worry about transport as the hotel provides free transfers to and from the hotel… and in a Mercedes, which gives you a little taster into the 5* luxury you are about to experience ! 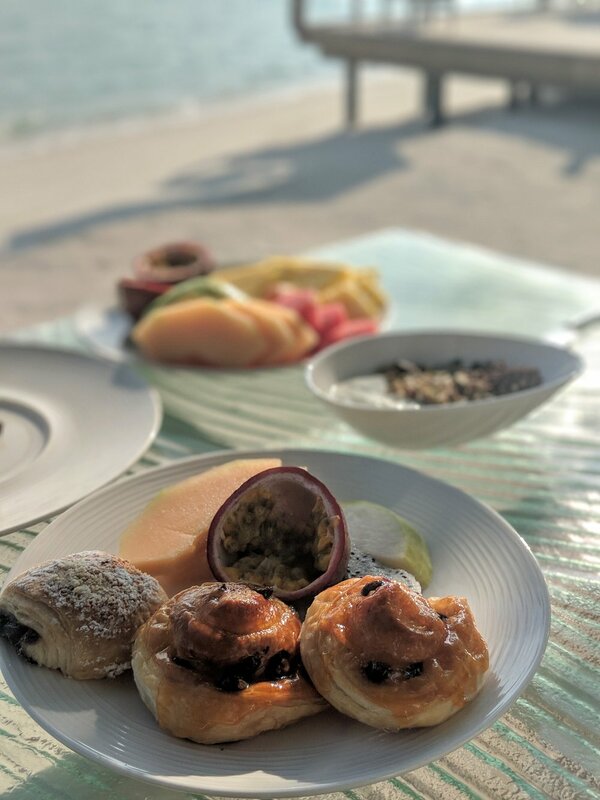 Upon arrival we were greeted with delicious welcome drinks and a tour of the resort & villas, the view of the bay from the hotel is simply breath-taking and the crystal clear water could have you fooled that you’ve arrived in the Indian ocean. The interior exudes chic and modern vibes with it’s plush fabrics, refined colours and Italian touches. We spent most mornings catching the sun on our veranda and when the sun slowly dispersed from our terrace around midday we headed down to the private beach, a 10/ 15 minute walk by foot. For the more sedate of you there is a glass elevator at reception that takes you almost down to beach level. For those who aren’t too fussed about privacy and don’t mind being around people, the beach is small and intimate and generally pretty full come midday. The sea however, is absolutely stunning, crystal clear and as smooth as sea can get, there is also a variety of water sports to get stuck into for the restless sunbathers! I’d advise heading to the beach bar to try out some of the mouth-watering cocktail creations, my mum was so impressed she had to take a snap of the cocktails to add to her dinner party menu! Tip: Go for the green colada cocktail, it’s a lovely blend of Gin, avocado cream, coconut and sage spices! If the beach isn’t for you, there is a gorgeous heated infinity pool situated overlooking the private cove. The pool is filled with skin-friendly seawater, and even has a section dedicated to children and younger guests. Each evening and breakfast we dined at the Pangea restaurant. Newly redesigned for 2018, it serves American buffet breakfast and buffet dinner and the wide selection of food will cater for anyone, even the fussiest of eaters. The restaurant features an open-air kitchen and two spacious outdoor areas with fantastic views of the ocean. For those who want to try out the other restaurants there is Taverna and Ocean restaurant which will need to be booked in advance. If you want to try some delicious local specialities like fresh fish and a selection of greek and international wines, these are the places for you! For those who like a bit of pampering and down time, there is the GOCO spa which offers a wide range of results-focused spa treatments combined with world-class heat and water facilities. Unfortunately we didn’t have time to make it here as we were only there for 3 days. As the holiday drew to an end, there was an overriding sense of tranquility and inner calm, a feeling that could only be achieved by the surroundings and magical calmness of Daios Cove. As we bid farewell to the lovely staff and got chauffeured back to the airport in the Mercedes, the 5* service from start to finish combined with the unparalleled experience and natural beauty of the place had me thinking of booking a return visit next Summer! Montenegro, a stunning little gem full of natural beauty with a tiny population and a vast landscape boasting gorgeous mountain ranges, beautiful beaches, clear lakes and quaint old towns. It is steeped in rich history and truly is a country everyone needs to visit. Now let's be honest, how many of you know anything about Montenegro? Or for that matter, where it sits geographically on the world map? Hmmm..
We will tell you, Montenegro is a tiny Balkan nation situated in the South of the Adriatic sea wedged between its Bosnian, Serbian and Croatian neighbours. To enter the country we flew in to Dubrovnik in Croatia and took a taxi an hour to the boarders where we then crossed in to Montenegro. Although tiny, the country is bursting with a rich culture invoking picturesque landscapes that an Instagrammer would only dream of! The cuisine in itself is enough to make anyone want to return! This has been voted the best 5* luxury hotel of the country and I’m not surprised why. We stayed here for two nights and were each spoilt with a deluxe room with a sea view, overlooking the hotels stunning waterfront location and its backdrop of beautiful mountain ranges. Porto Montenegro is the leading marina village and luxury yacht homeport in the Mediterranean, thriving with superyachts, restaurants, bars and boutiques. It is well worth an afternoon roaming around the port, to do a spot of shopping or just to grab a bite to eat in one of their many delicious restaurants and soak up the beautiful surrounding views. The hotel has two outdoor pools and an indoor spa and wellness area which looks stunning! Unfortunately, we didn’t have the time try it out but it would be the perfect place to unwind for a couple of hours. The interior and decor of the hotel is nautical themed and reminiscent of a private cabin on a luxury liner. Very easy on the eye indeed! Along the Southern coasts are some of Montenegro’s most beautiful vineyards. After hopping off our two and a half hour plane journey, we drove straight to the Savina winery located at the entrance of the Bay of Kotor. (Nothing like a glass of local wine to wake you up!) The views from the winery were breathtaking and we spent a few hours discovering the vineyards and learning about the distilling processes whilst sampling all the delicious local wines and Mediterranean-style tapas of olives and cured meats. A perfectly delicious spring time activity if you’re there! A UNESCO world heritage site, this old city is riveted with tradition and culture, it was built between the 12th and 14th centuries. Kotor is filled with Medieval architecture and historic monuments, churches and museums. If you’re looking for a cultural day out- this is your best bet! The cute cobbled streets and brightly coloured buildings ooze such character and personality. We had a brilliant tour guide as well who led us through the city’s narrow streets and busy squares, explaining everything with such interest and enthusiasm….Not going to lie, he was pretty easy on the eye too...that could have helped the education process! If you are in Kotor then you must take a short boat trip to the small and beautiful town of Perast across the bay. With sixteen palaces and nineteen churches and ZERO development, this is an absolutely beautiful undiscovered little gem. Have lunch on the edge of the Adriatic sea at the Conte restaurant and hop back on a boat to visit the stunning church and museum located on ‘Our Lady Of The Rocks’. 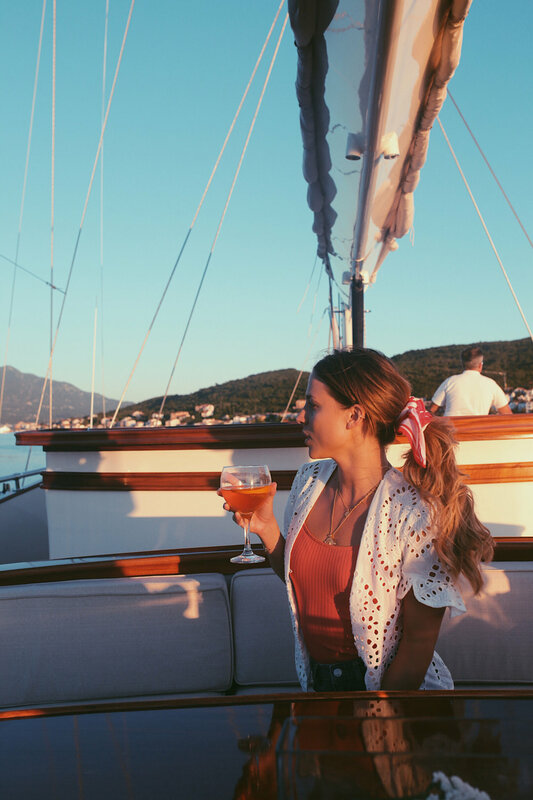 If you’re looking for a leisurely afternoon why not head to Porto Montenegro and stroll along the stunning marina in the sun surrounded by a jetty of super yachts. If you’re a slight shopaholic (like us) you can splash out in shops from Dior to Valentino, MaxMara and Heidi Klein. The retail complex offers tax free shopping for visitors from outside Montenegro...Score...And if you get tired of shopping you can choose to have a nice lunch in one of the marinas many restaurants, cafes or bars, serving a variety of food from light bites, fresh seafood, pastas and pizzas. I wouldn’t say no to a glass of local wine either. Ok, so this really is a breathtaking location and the perfect chill spot! We spent the afternoon relaxing on the poolside daybeds sipping on cocktails along the iconic infinity edge swimming pool. Head there for an afternoon sunbathing session and a leisurely swim in the pool with its beautiful backdrop of mountains. Or if you're slightly peckish you can enjoy some food at the bar and restaurant or later in the evening at the mezzanine fine dining restaurant followed by a boogie at their nightclub. Tip - Ask for the coconut or pineapple cocktails. They are mouth-wateringly delicious! This was such a beautiful setting for lunch. Sitting right on the side of the Adriatic sea with the sun beaming over us and tucking in to the most fabulously fresh sea food platter. I tried my first Oyster here which was actually way less scary than I had always made out it to be….even though I’m not sure I’d rush at the chance of having another one but I was spoilt for choice with everything else on the platter. Everything freshly caught from king prawns to grilled and fried squid, mussels, clams, seafood paella. You name it, it was on there and all of it accompanied with baskets of fresh bread and olive paste and of course the local wine which just completes the entire meal. Thank you please! 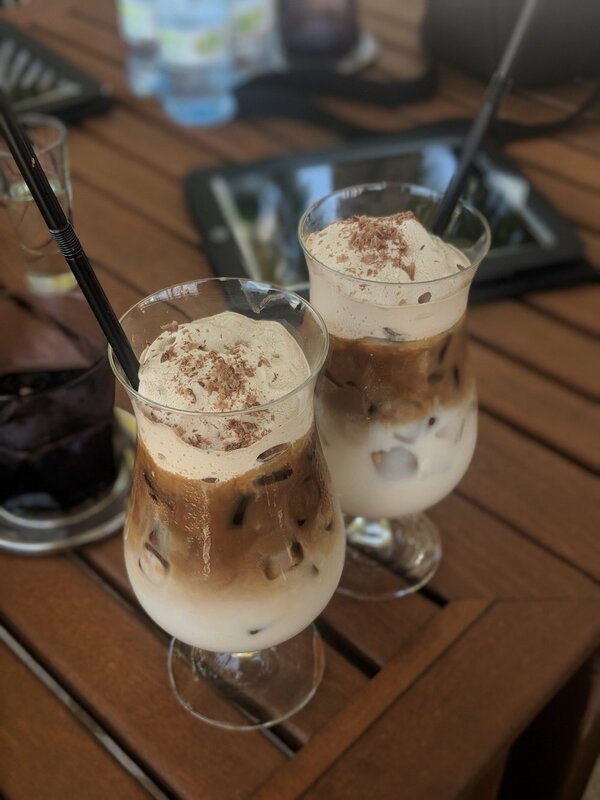 Located in the village of Porto Montenegro, this delicious Mediterranean restaurant is situated right on the marina with a spacious terrace ideal for romantic dinners/ outdoor brunching or sunset drinks. We spent our last night for dinner here and were recommended a dish of fresh sea bass wrapped in paper with freshly grilled vegetables and wow, was it tasty! One of the best fish dishes I had eaten in a while. We were also spoilt for choice with the wine list boasting of the widest rose selection in the country. It’s easy to have a few too many…I mean, it would be rude not to. I’m an absolute sucker for all things sweet- deserts are my weak point so I was determined to try a few options on the menu. Tip: Go for the strawberry cheesecake, it is to die for! The chocolate mousse, mind you, swoops in at a very high second! Overall, a delicious dining experience. We dined here on our first night, located in the hotel with views overlooking the glittering super yacht marina and Boka bay outside. The food is centered around fresh seafood prepared with locally sourced and organic herbs, all offering a distinctive take on the regional Adriatic cuisine. This meal set the standards high for the rest of the trip with its delicious risotto and barbecued fish kebab for starters and deliciously fresh grilled monkfish for mains. All beautifully presented and accompanied with some of the regions most delicious rose wine. This is a definite hot spot dining choice! So I think you already got the gist, I’m a sucker for a great desert! I was in for an absolute treat when we discovered the ‘Gourmet corner’, a quintessential patisserie, gourmet delicatessen and bakery just on the corner of the hotel offering the most beautiful and delicious cakes, pastries, teas and coffees. If you’re having that midday sugar craving (that I tend to suffer from) come here and order a slice of carrot cake.….You’ll thank me later. Who said the Maldives was just for Honeymooners? It was our first time to the Conrad, Maldives, Ranhali Island and boy were we blown away! As most of you know we came to the Maldives, the Christmas before last with my Mum after a much needed getaway. This time it was a tad different, Loanne and I were joined by our two blogger pals Sabrina and Amy and our good photographer pal Charlie (Charlie’s angels we called ourselves ha!) We spent 4 days at the award-winning Conrad Maldives Rangali Island, an untouched slice of paradise that boasts awards winning dining featuring 12 world class restaurants and bars, two spas and an abundance of locally inspired experiences. 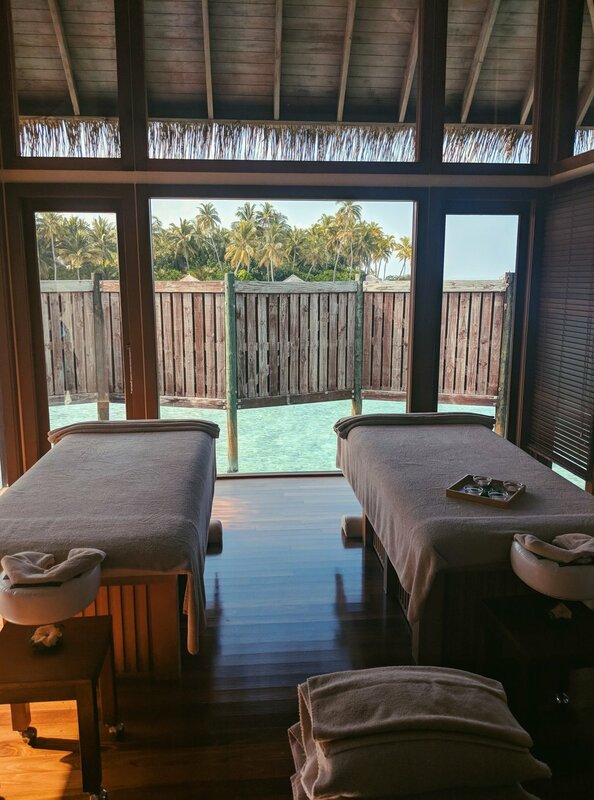 We maxed out in a dreamy water villa which had it’s very own outdoor decking/ veranda with a private jacuzzi and wooden steps leading into the crystal clear water. Now most people would assume that the Maldives is for honeymooners or couples looking to have a romantic getaway and although you are right, let me tell you that doing it with friends or a sibling gives it that extra dynamic, the late night chats, the jokes and laughter and of course sharing wardrobes & a common interest in photo-taking! I may go as far to say it’s even better. Below I've listed the best activities to do with friends on the Island..
You can’t really get better settings than the spa retreat, set over a lagoon at the tip of Ranhali finolhu Island and built on stilts over the turquoise water even just stepping foot on the premises leaves you in a tranquil and zen mood. We were taken through to our very own private spa room with beautiful ocean sea views an an open plan outdoor toilet… extremeley bizarre. We had a 1 hour full-body massage that allowed us to sink further into the realms of relaxation. The spa also offers a range of holistic spa and beauty treatments that will cater to your needs. It was near impossible to decline any sort of culinary dish at the Conrad as the food was so incredible, each chef a master of his own craft whose attention to detail on food pairing, flavours and presentation exceeds it all. Not great for the bikini shots but 'hey ho' we couldn’t resist the sumptuous food that was presented before us. Koko grill had to be my favourite restaurant though, it’s an open air restaurant on the beach where the chef prepares 10 exquisite Japanese courses featuring locally sourced produce and the finest ingredients imported from around the globe in front of you. The fish is so fresh and the Sake was the best I’ve tried! We spent the evening indulging in a variety of different flavours, sipping on Sake and and taking in the stunning views. If you’re going to wake up and watch the sunrise, this is how you do it! Loanne, Sabrina and I woke up at 5am and had a private yoga session with long time Keralan yogi Manesh Johny who adapted his class to our particular capabilities. 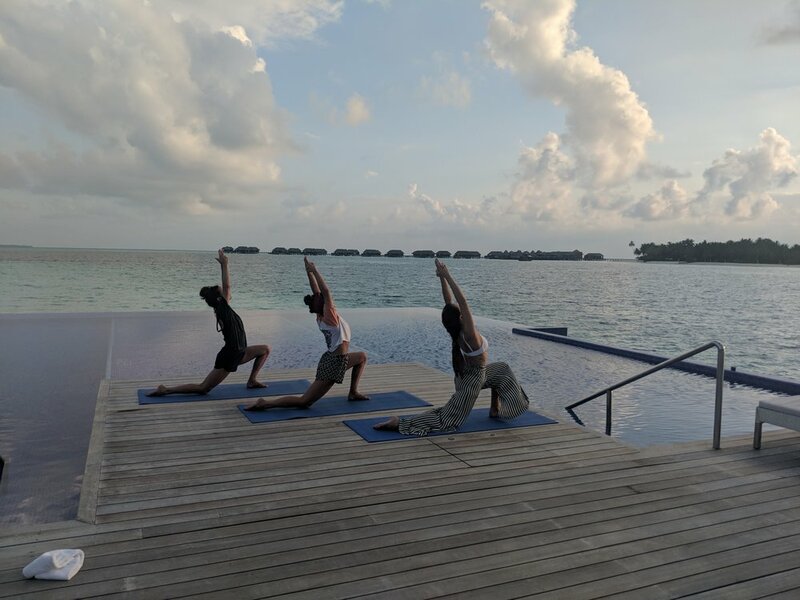 This took place at the quiet pool where we spent 40 minutes perfecting our flow, hatha and vinyasa whilst watching the sun slowly creep over the horizon diluting the sky a pink and orange blush. Usually on snorkelling trips you don’t expect to swim with anything bigger than a few tropical fish and a stingray if you’re lucky… but the Conrad is one of the best locations to spot giant whale sharks and Manta rays so when we got to swim with them, it was rather surreal, we were snorkelling with a 10m whale shark directly beneath us! If you’re not a huge snorkeller you can always sit on the deck and soak in the sun rays, we were lucky enough to have our very own private snorkelling trip so it felt more relaxed and intimate. What a way to watch a sunset! A small group of around 10 of us took a luxury Yacht out for a couple of hours to watch the sunset with champagne and canapés. Whilst the sun was slowly setting over the horizon we spotted a school of spinner dolphins gliding and jumping in unison with the yacht, it was so magical, only something like this happens in paradise. 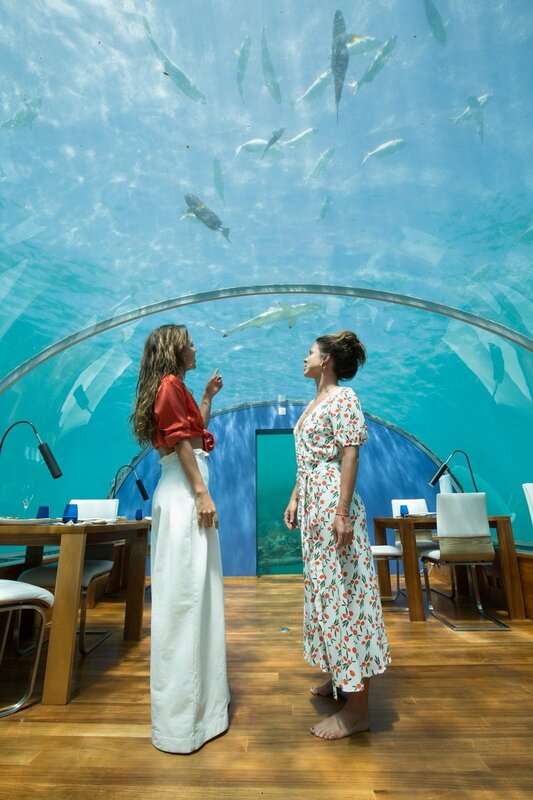 I’m sure you have all seen the photos of the undersea restaurant on instagram… well yes, that’s here. We literally couldn’t contain our excitement when we arrived here in the morning for champagne, 16 feet below sea level It’s the world’s first undersea restaurant offering 180 degrees panoramic views of the vibrant coral garden’s surrounding it, the morning was spent laughing away, sipping on champagne whilst watching sharks, manta rays and beautiful tropical fish swim above our heads! Champagne & star gazing in the hot tub! One of the best things about having our own water villa was the outdoor decking with our own private jacuzzi, so at my favourite time of day sun set, we opened up a bottle of bubbly whilst playing music from our speakers, sat in the jacuzzi and ended up dancing whilst watching the sun turn shades of blood orange over the water, we then proceeded to do some star gazing whilst enjoying each others company and taking in the breathtaking views!